In Roulette, Players place their bets on numbers depicted on the table, including the single zero "0" in (European roulette) and double zero "00" in (American roulette) spaces. Once all bets are placed, the croupier starts the wheel spinning, adding the ball rolling in the opposite direction some moments later. Just before the ball drops into one of the slots on the wheel, the croupier declares "No more bets". At this point, no players are allowed to place or change any standing bets. Only after the croupier places the "dolly" on the winning number, and all loosing bets are removed is new betting allowed. The winners are those who selected the number of the space the ball landed in, as well as adjoining spaces/numbers. Additionally, bets placed on the outside of the layout are paid if the correct number is represented. Roulette is simply a game of chance. The object is to pick the number the ball will land in. It is played on a table of thirty eight numbers, including a zero and a double zero. The rules allow for many different ways to play roulette, and win. 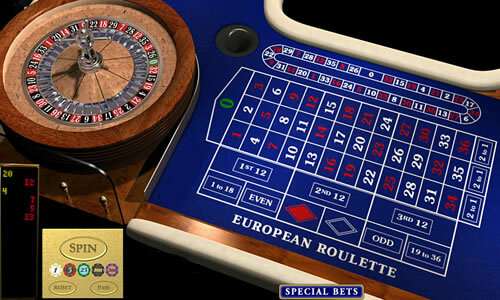 Visit each roulette table before selecting one. Each should display clearly the minimum and maximum bet as well as the house rules. Pick a table with a minimum bet within your budget, and ask the croupier to change some chips for you. During the betting timeframe, place chips on the number or numbers you have selected. Cash in your chips with the croupier when you are done playing. Normally, the chips used at the roulette tables can not be used at other gaming tables. Except online, those chips can be used for all games. The Straight-Up bet is when you select a specific number to win. If you select correctly, the house pays 35 to 1 odds. Split Bets are placed on the lines between two numbers, the odds paying 17 to 1. A Row Bet is placed on a row of three numbers, any of one of them hitting pays 11 to 1. A Corner Bet is when you place your bet on the junction point between four numbers, which if any number wins pays 8 to 1. A Street Bet is placing a bet on the junction between two rows, which pays 6 to 1. The Column bet is placed at the bottom of a column of twelve. It pays 2 to 1. There are a number of other bets called even bets that can be placed, such a black or red, odd or even, 1 to 18 and 19 to 36, each of which pay 1 to 1. You place these bets on the table in clearly marked spaces.